Located at the corner of 7th & Cherokee Streets, the building was constructed in 1935. Designed in the art deco style of that era, the structure was originally a Mobil service station. 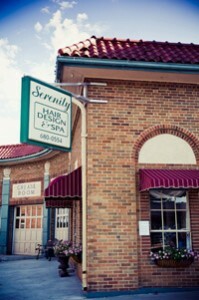 Renovations were made to the building, and Serenity Hair Design & Massage opened its doors in December 2005. From that time, we have enjoyed a revitalization of our portion of downtown Leavenworth. Across the street is the new Haymarket Square pavilion, which is home to the farmer’s market throughout the summer and fall, as well as other events throughout the year.